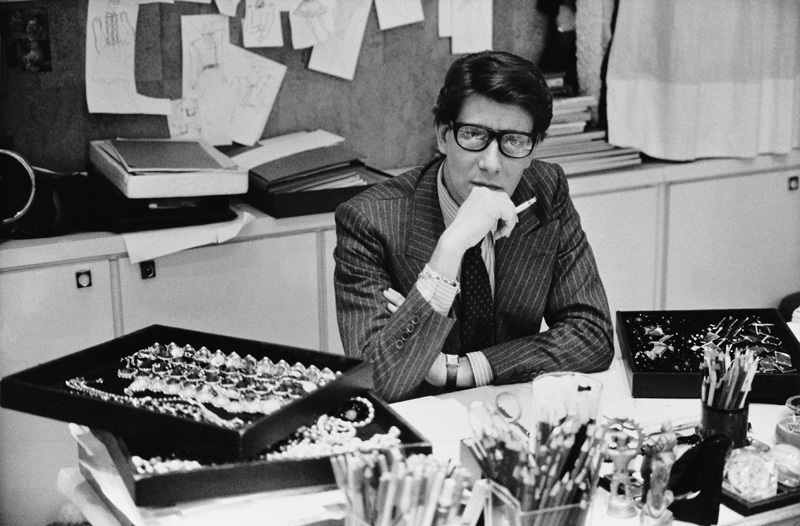 Yves Saint Laurent was a genius – a visionary who became a legend at an early age. Today his name graces a variety of products from luxurious cosmetics to high-end handbags. Knowing a bit about his background will enhance your visit to this excellent new museum. Saint Laurent’s career began with The House of Dior at the age of 19. When the legendary Christian Dior died in 1957 he named the 21-year-old Saint Laurent as his successor, the youngest couturier in the world. He had six months to put together a collection for the January 1958 show. The show was well received, putting his name on the map and ensuring a bright future. In 1961, Saint Laurent along with his partner Pierre Bergé, established the legendary fashion house YSL at 30 bis Rue Spontini. Bergé raised capital while Saint Laurent created garments that we consider essential today. His debut collection in 1962, featured the first pea coat and trench coat. I can’t imagine life without a trench coat. He revolutionized women’s clothing and changed how we dress. The first tuxedo known as Le Smoking was introduced in 1966. Borrowed from the boys but feminized by the designer, this black-tie suit is still à la mode half a century later. Saint Laurent introduced the first pantsuit in 1967 and in 1968 brought out the first safari jacket and jumpsuit. Still classics to this day. I’ve barely scratched the surface of his ‘firsts’, it’s easy to see why the museum’s opening was so highly anticipated. It’s the history of modern fashion. In 1964, Saint Laurent began to set aside pieces from each collection along with the corresponding sketches, fabric swatches, and accessories. This amounted to thousands of designs. 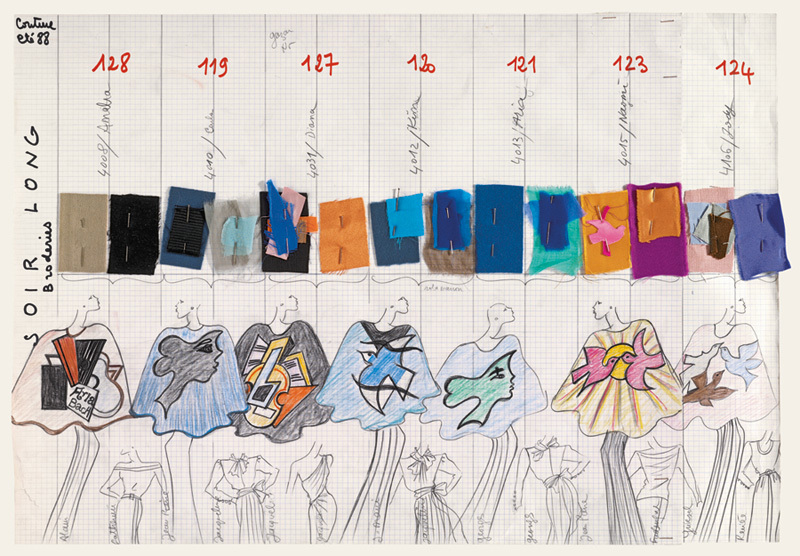 Even though it was early in his career, he could visualize a YSL museum decades later. 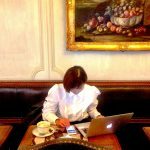 He continued to create on many levels and in 1974 the fashion house moved to the opulent Hôtel Particulier on 5 avenue Marceau. From there the designs continued to flourish. In January 2002, Saint Laurent formally announced the end of his design career and the haute couture house. Retirement was not on his mind however. In 2004, Bergé and Saint Laurent opened The Fondation Pierre Bergé – Yves Saint Laurent. Its purpose was to promote art, fashion (Saint Laurent and other designers) and photography exhibitions. 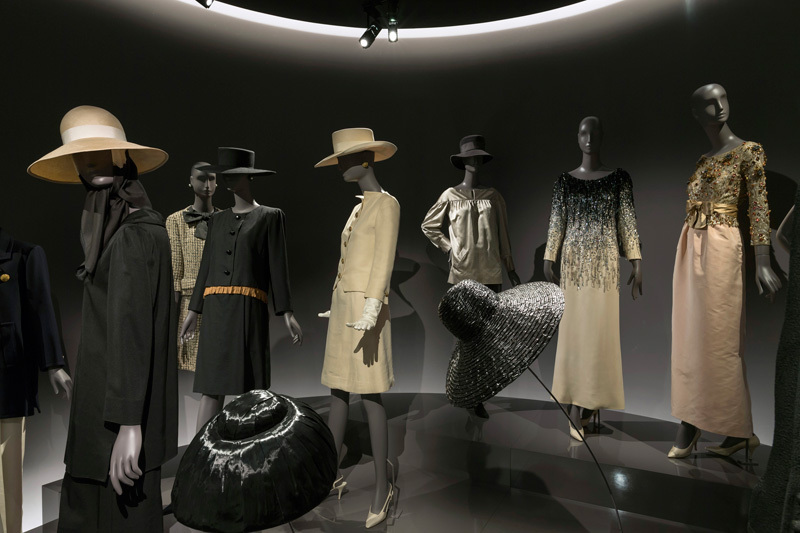 A staff member stated “The exhibitions were always popular but the most popular were those devoted exclusively to Yves Saint Laurent.” I could see why. Yves Saint Laurent passed away in 2008. 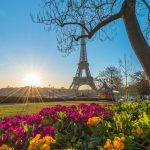 The Fondation continued until 2016 when Bergé decided the mansion should undergo refurbishment and reopen as a fully-fledged museum devoted to all things Yves Saint Laurent. 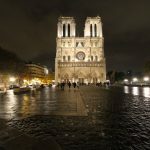 In a large elegant room with gilded mirrors, golden statues and magnificent chandeliers, a YSL fashion show is screened. Sitting on a golden chair watching the movie, it’s as if you’re transported back in time. The museum is laid out beautifully. Mannequins on podiums make it easy to view the details of the iconic garments. The gallery titled The History of a Collection depicts what goes into the making of an outfit as well as how a collection is put together. The sketches with fabric swatches attached, covered with notes. There is so much detail on every sheet. There is a darkened theatre on the mezzanine where you can watch a short film about Saint Laurent and Pierre Bergé his longtime partner in life and business. In French with English subtitles, it’s like watching a home movie. 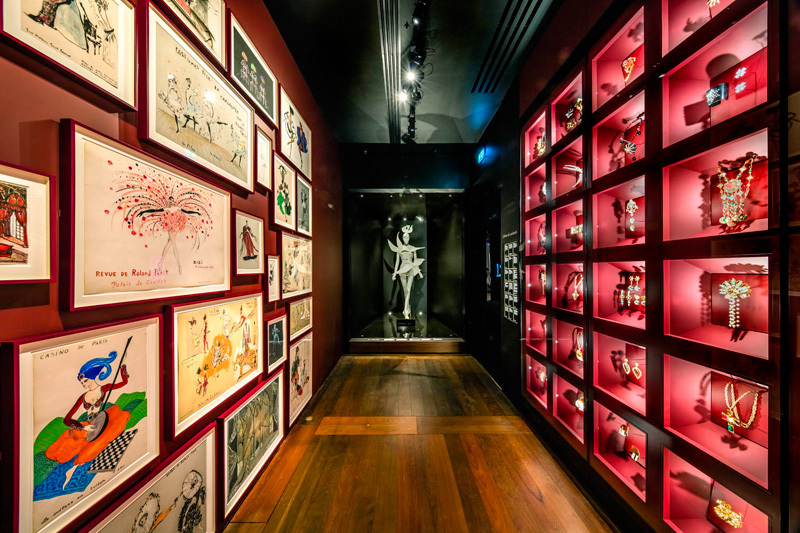 A wall devoted to Saint Laurent’s brilliant drawings is opposite the Cabinet of Curiosities which contains jewellery. Some pieces are simple, many are over the top, all are superb. The highlight is the studio. Large windows provide light and the mirrored wall makes the room appear larger. Saint Laurent used the mirror to view a model’s reflection while working on a creation. The room looks as if he just stepped out and will be returning soon. Everything is where it was left, including his work jacket draped over his chair. His desk was simple, a covered board atop two trestles, his glasses sit among the keepsakes. There are six videos which give a feel to what life was like in the studio. His colleagues take you from the conception of a garment to its sale. It was fascinating. 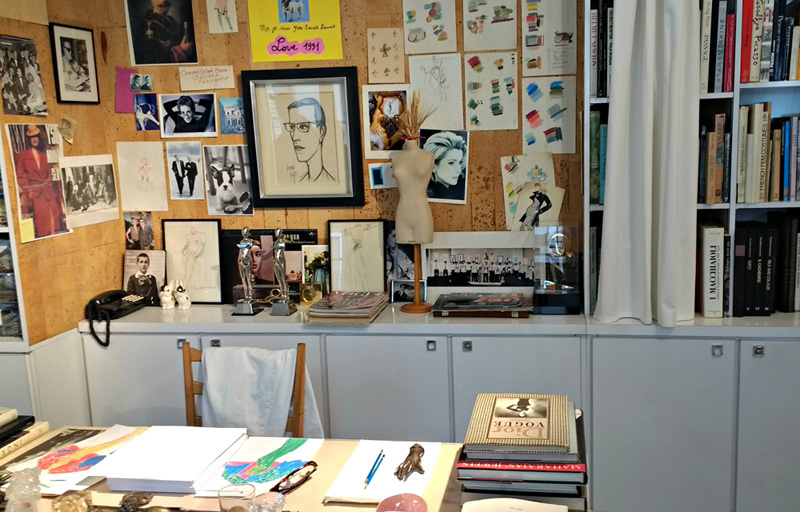 It really does take a village – over 200 people worked with Saint Laurent. 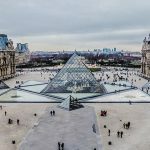 This is a museum with a capital M. The Fondation owns 34,703 objects. 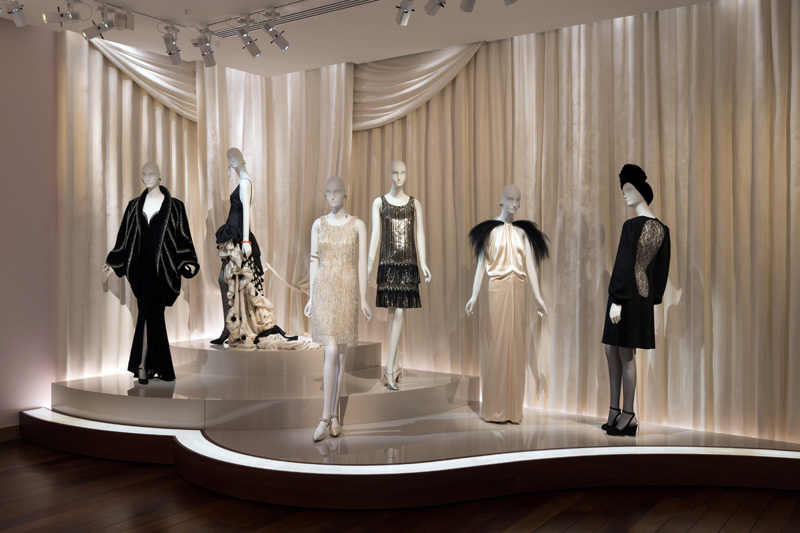 They include personal items, couture, costumes created for ballet and films, accessories, sketches, photographs, and works of art—including four paintings of Saint Laurent by Andy Warhol. Because of the magnitude of the collection, there will be a rotation several times a year. A reason to return—regularly.